Dr. Farid Gharagozloo got his medical degree at Johns Hopkins University School of Medicine and did his residency at Mayo School of Graduate Medical Education. He then went to Brigham and Women’s Hospital and did his first fellowship. He obtained his second fellowship at Mayo School of Graduate Medical Education. Dr. Gharagozloo is board certified in thoracic and cardiac surgery and has over 20 years of practice. 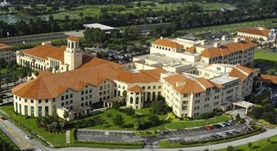 He accepts many types of insurances and is currently affiliated with Florida Hospital Celebration Health. Dr. Farid Gharagozloo has contributed to 3 publications. Unilateral robotic hybrid mini-maze: a novel experimental approach. Moslemi, M.,Rawashdeh, B.,Meyer, M.,Nguyen, D.,Poston, R.,Gharagozloo, F.; Int J Med Robot. 2015 Mar 03. Robotic training in cardiothoracic surgery. Poston, R.,Gharagozloo, F.,Khalpey, Z.,Kim, S.; Ann. Thorac. Surg.. 2014 Jan 05.